Exeter Chiefs may have secured their place in this season’s Aviva Premiership play-offs, but Director of Rugby, Rob Baxter, insists there can be no let-up from his side in their quest for glory again this season. Eight points clear at the summit with just three rounds to play, the defending champions travel to basement club London Irish this Sunday (3pm) looking to bag the necessary two points they need to ensure home advantage in the last four next month. However, the Exiles still have plenty of fight within them and having kept alive their survival hopes with an impressive away win at Harlequins last time out, they know toppling the Chiefs is a must if they are to haul in either Worcester Warriors or Northampton Saints in these final weeks. Quite rightly, Baxter is wary of the threat posed by Irish, who seem to have transformed themselves under the guidance of new coaches Declan Kidney and Les Kiss in recent weeks. “The biggest stat to come out having looked at them over the last few games is probably how quick they have started games,” warned Baxter. “They’ve got out of the blocks and scored points in a few of their games. On occasions they have been hauled back in, but at other times they haven’t, so that’s something we have talked about this week. “We’ve said we need to be focused from the start, something we perhaps weren’t against Gloucester last week. We could easily have paid the price by conceding a try early on in that game, so it’s something we must try to avoid at all costs at the weekend. At the same time, Irish will recognise the considerable threat posed by Baxter’s side, who have won their last four Premiership fixtures.The Chiefs are in fine fettle and with a near full-strength squad to select from, the Exeter leader says he will be monitoring closely the performance of all his players, both in training and in matches, to assess who should lead their title fight. “The key is to avoid getting carried away with results,” said Baxter. “I don’t want to make it about stringing results together, I want it to be about stringing performances together. “A lot of the talk at the weekend was securing a top four spot and people will always talk about that. But people will also talk about one more win securing a home semi-final and you can start to get too focused into thinking you have done the hard bit and ticked off the first box. We haven’t. “If our performance from Gloucester to London Irish improves, that should affect the scoreline. I don’t want to see us caught up on collecting points though. As I said, I’m not looking too much at the result, but more so our commitment to the game and how much each player can bring to their individual and collective performance. “We’ll have a real good look at the technical stats we get out of the game, like how hard we are prepared to work, how hard we push our heart rates, and how quick and how far we are prepared to run. Those are the elements I expect to see the guys test themselves in. Baxter’s messaging is not only clear and concise, but also reminds his squad that nothing will be left to chance as they look to replicate their title success of last season. “Things will come down to fine margins in the end,” continued Baxter. “We will make changes week by week, but we did that at the end of last season and it served us very well. Those changes, though, will be done for the right reasons. We won’t put people out there who aren’t fit to perform well for us. Nor will we make changes just to give someone an opportunity out of nowhere. As mentioned, Baxter has rotated his options with several notable changes to the starting line-up from that of last weekend. In the pack, Ben Moon, Mitch Lees and Dave Ewers are all promoted from the bench to start at the Madjeski Stadium, while behind Gareth Steenson will skipper the side from fly-half; Ian Whitten moves into the centre alongside Henry Slade; and international duo Santiago Cordero and Jack Nowell, fresh from scoring two last weekend, both start on the wings. On the bench, Harry Williams, Moray Low and Thomas Waldrom all return to first-team duties, whilst Tom O’Flaherty is also named as a replacement having impressed recently during the club’s Anglo-Welsh Cup success. 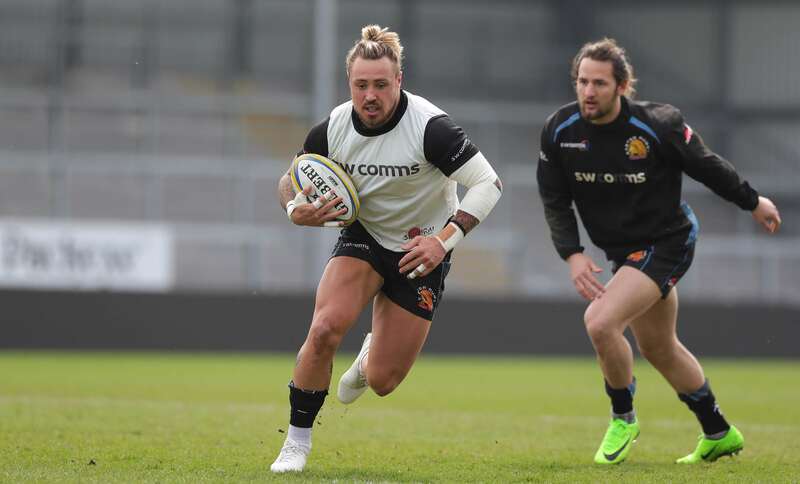 Jack Nowell will start for the Chiefs against London Irish on Sunday.